WOLCOTT - For the first time since 2005 the Woodland Hawks are headed to the Class S State Championship game after defeating Bloomfield, 30-26. "There is no better feeling," said Woodland senior quarterback Tanner Kingsley whose brothers played on the 2004 and 2005 State Champion Woodland teams. "There was goal then this, while I was growing up." Kingsley led the way for the Hawks throwing for 258-yards and four touchdowns, which gave him the State record of 113 career passing touchdowns. 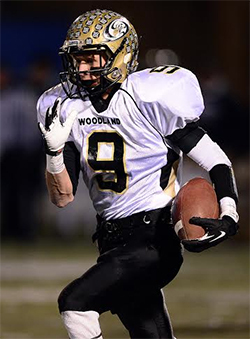 "His dedication his work ethic, he stepped up," said Woodland head coach, Tim Shea. "He stepped up when we needed him to." Kingsley wasn't the lone star for the Hawks in the semifinals. After losing back up running Cody Vaccarelli to a knee injury in the first half, they were already missing starting running back Sean McAllen whose out with a concussion, the Hawks turned to senior wide receiver Taylor Tucciarone. The senior stepped up rushing for 92-yards just in the second half to go along with his seven catches 109-yards and two touchdowns that he had in the first half. "Before the second half in the locker room we told him that he was going back to running back," said Shea. "It was a great effort, he's bought in. I am very pleased with his effort." Bloomfield was led by senior quarterback Norvel Stewart who rushed for 222-yards and accounted for all four of the Warhawks touchdowns, one coming from 72-yards out. "Stewart did a great job leading our team," said Bloomfield head coach Tylon Outlaw. Woodland will face Ansonia in the Class S title game next weekend at Arute Field at a time not yet determinded. W - Coby Vaccarelli 8 for 41-yards; Chris Slavin 1 for -2; Tanner Kingsley 9 for -19-yards, one touchdown; Taylor Tucciarone 19 for 92-yards. W - Taylor Tucciarone, 7 catches for 109-yards, 2 touchdowns; Coby Vaccarelli 3 for 26-yards; Jack Pinho 3 catches 53-yards, one touchdown; Dylan Abarzua 2 catches for 20-yards; Joe Poeta 3 catches for 27-yards, one touchdown. Mike Kenney 2 catch for 23-yards. B - Russell Thompson-Bishop 2 catches 20-yards; Pedro Roman 1 catch 9-yards; Andrell Pinnock 1 catch for 8-yards. WALLINGFORD - Arkeel Newsome rushed for 269 yards and five touchdowns on 36 carries for the No. 2 seeded Ansonia football team, which beat No. 3 Rocky Hill 49-27 Saturday afternoon in the Class S state semifinals at Riccitelli Field. Newsome, the state's all-time leading rusher, scored four of his touchdowns in the first half for the Chargers (14-0), including a 46-yard burst on the final play of the first half to make it 34-7. That gave Newsome 195 rushing yards at halftime. This was the 42nd consecutive win for Ansonia, which is a two-time defending champion (class M in 2011, class S in 2012). Rocky Hill finishes at 11-2 in the final game for head coach Dave Coyne. Chris Young finished with 137 yards and two touchdowns on 20 carries for the Terriers. Tight end Thomas Seaver caught six balls and 119 yards and two touchdowns for Rocky Hill. Tyler O'Connell recovered a fumble and a interception off a tipped pass for Ansonia. Rushing-Rocky Hill: Chris Young: 20-137; Ryan Lombardo 7-34; Kenshaun Gamble 2-18; Dave Sevigny 3-3; Andrew Jenkelunas 3-2; Ansonia: Arkeel Newsome 36-269; Tajik Bagley 2-6; Jaiquan McKnight 1-4; Saiheed Sanders 1-4. Receiving: Rocky Hill: Thomas Seaver 6-119; Ansonia:Witold Gul 2-102; Tom Majchzrak 1-15. NEW BRITAIN -- Almost as soon as it had begun, it was all over. 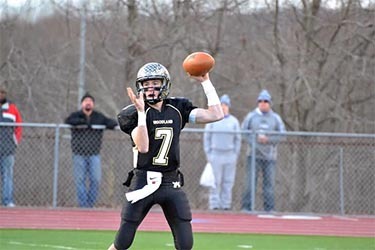 Ansonia snagged two takeaways on Woodland's first two offensive plays and converted both into touchdowns as the Chargers claimed the Class S championship with a 51-12 victory over the Hawks on a frigid Friday night at Central Connecticut State University's Arute Field. Ansonia (15-0) became the first team in Connecticut history to play and win 15 games. The Chargers also won their record 19th state championship--including their third straight--and extended their winning streak to 43 games. "I say we're the No. 1 team in Connecticut," Ansonia senior lineman Antone Mack said. "I hope we played good enough defense to show all the doubters we can play. But if we don't end up No. 1, we still won the game." Woodland (12-3) dug itself a hole right off the bat as Tanner Kingsley's first pass wobbled into the arms of Tyler Bailey for an interception. Arkeel Newsome cashed in on the turnover with a 6-yard touchdown run to make it a 7-0 lead less than 3 minutes into the game. "That was definitely a boost," Newsome said of Bailey's pick. "We had the momentum and we scored right after that." On the Hawks' first play of their next drive, Bailey crashed in on Jack Pinho to force a fumble after Pinho caught a short pass. Witold Gul scurried down from his safety spot and completed the scoop-and-score with a 27-yard runback for a 14-0 lead. "We were ready for a dogfight, and that was just another shot of adrenaline," Chargers senior lineman Antone Mack said. 'We knew if we could get some more turnovers or just manage the game like we usually do, it would be a blowout." Woodland clawed its way back into the game with a pair of defensive stops and a solid drive to open the second quarter. Tanner Kingsley hit Joe Poeta with a 37-yard strike to get the Hawks into the red zone, and Kingsley popped a 14-yard run on the next play to make it a 14-6 game with 10:26 left in the second. That was as close as Woodland got, though, as Newsome added touchdown runs of 2 and 8 yards later in the quarter to make it a 28-6 lead. Between those scores came Bailey's second interception of Kingsley, this one in the end zone, to end the Hawks' momentum. "You can't spot them like we did and play from behind," Woodland coach Tim Shea said. "Then they dictate how you play them. Tanner forced a few balls into the red zone, they picked one and they force your hand. They score in bunches, but they can also drive down the field and be physical." Newsome concluded his record-setting career with 259 yards and four touchdowns on 34 carries. He also threw an 11-yard touchdown pass to Tom Majchrzak in the fourth quarter. Newsome sits atop record charts for all-time rushing yards (10,672) and touchdowns (187). Ansonia took a 28-6 lead into the half before pulling away after halftime. Kingsley finished a record-setting career of his own with 140 yards on 11-of-21 passing with two interceptions. He also ran for 50 yards and two scores. "They made us earn it," Ansonia coach Tom Brockett said. "We made a few adjustments at the half and we were able to pull away."